Back in March we were approached by Waitrose and asked to make the largest picnic rug in the world for an advert they were shooting in April and that has just been released. We managed to weave this rug which is 40 mts x 44 meters in the three weeks available and it was a sensational job. This project was only realised because of an amazing amount of hard work & commitment from the staff at the mill, plus tremendous support from our yarn supplier & cloth finisher. It just goes to prove that UK manufacturers can still be best in the world at the fast turnaround of high quality and bespoke products. There were plenty of problems, the main one being the short time available but we really enjoyed it, Waitrose were really pleased and the advert is fantastic. After the filming the rug was cut up into smaller blankets which all went to the various children’s charities in Africa that Waitrose supports. It was a wonderful project to be involved with (see more details below). There will be a documentary about the making of the picnic blanket and the advert itself out soon, probably on Channel 4. We’ll keep you posted. For those of you who asked for more information about our giant picnic rug. The giant picnic blanket which forms the centre piece for the Waitrose television ad was specially commissioned is equivalent to the size of four tennis courts - 40 metres x 44 metres and weighs one tonne - has been certified for a new Guinness World Record* as the largest picnic blanket in the world. Following the filming of the ad in Durban, South Africa, the blanket was donated to the Waitrose Foundation, a project dedicated to improving the lives of South African Farm Workers who grow and pick fruit for the supermarket. Farm workers at Westfalia Farm, an avocado growing farm in the Limpopo Province, will turn the blanket into over 400 individual quilts with workers being paid for each quilt they make. The quilts will then be donated to crèches across Waitrose Foundation farms and distributed to the workers of the Foundation farms for use in their homes. Watching the television on Thursday night I was amazed to see our blankets on four programmes one after another. Different channels of course. We were on Cwpwrdd Dillad at 8.30pm. and Pedair Wal at 9.00pm. both on S4C the welsh language channel. Then I turned over to BBC1 and saw our cushions on the Apprentice.Our cushions have been used in the Apprentice House for the last two years. We’ve certainly lasted longer than the candidates. 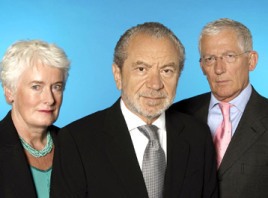 Lastly over to BBC2 for The Apprentice - Your fired and there we were again in the backgound when John Alex and Lee were attacking Sara and Raef came to the rescue and our cushion provided much needed comfort. Blanket coverage for a Thursday night.